Dead Monarchy is a Medieval, Turn-Based, Mass-Tactics RPG with survival elements. It is a game influenced by other games such as Battle Brothers, Banner Saga, XCOM, Age of Decadence and Jagged Alliance. Dead Monarchy is a game created by one guy, addicted to turn-based games. At its heart, it is about the management of a mercenary company that travels the lands in search of fame and glory and perhaps nobility. Dead Monarchy will be continually developed over the course of 10 years, because that is the most realistic time frame I can give myself to fulfill all my goals. It will come in two modes, "Tourney Mode" and "Monarchy Mode". Tourney mode will be more focused on combat and company management and as the name suggests, is centered around medieval tournaments. With the addition of the overworld map, Dead Monarchy will eventually grow into "Monarchy Mode". With the overworld map in, tournaments will become a dangerous but lucrative side activity. Eventually the two modes may be seamlessly integrated as other activities such as dungeon delving and minor territorial gameplay mechanics get added. It will be a long journey but an eventful one, a journey I am hoping that you will join. I don't have a dedicated QA team, I only have you. From one player to another, let's make a game that will make us social outcasts! Kidding. - Command up to 12 mercenaries/knights/murderers/colorful backgrounds in glorious turn-based combat. The party size may increase in the future. - Unique weapons that define your play style and character growth. Greataxes, Longswords, Rapiers, Axes, Hammers, Maces, Scimitars, Swords, Claymores and the Daito and more! Each weapon will have its own skill tree. - Two types of turn-based combat. 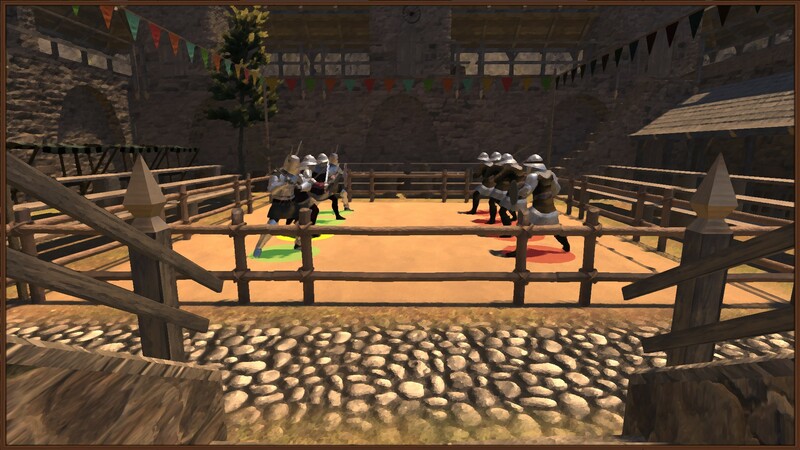 In tourney combat, combat is divided into player and enemy phase, all actions are queued and play out at the end of each respective phase. This introduces interesting dilemmas as you can no longer immediately react to each action in a phase, plan ahead and consider every possible outcome. In field combat, phases are still divided between player and enemy but actions are no longer queued, they are triggered immediately on player input and will be something you are more used to if you played more or less any recent turn-based game. This opens up abilities that are not fully suitable for tourney combat, IE abilities that grant free actions. Having two different types of combat systems means you will have to decide between developing your mercenaries for field combat or tourney combat. - Diverse Enemies: The point of perspective is from the feudal European kingdoms and you will come into contact with factions inspired by the Romans, Greeks, Ottomans, Persians, Chinese, Japanese, Danish Vikings and Celtic Tribes. Each faction will introduce unique weapons and challenges that augment your current strategy. - Diverse Equipment: No flaming shoulder pads. With each faction, comes unique armor and weapons that are inspired from history and as such, grounded in reality! - Meaningful Violence: Decapitate a head to reduce the morale of your enemies, but first you'll have to destroy his/her helmet. Armor plays a pivotal role and protects your units against weapons but eventually can be worn down and destroyed. - Company Management: All mercenaries love gold and need to eat! Balance your expenses as you struggle to outfit and pay your mercenaries, each death is an investment gone wrong. Hello permadeath! You can also follow Dead Monarchy on Twitter and Facebook: @Dead_Monarchy. I'm also on the codex, I post quite frequently there and then branch out to other forums. Dead Monarchy - Early Access: Build 1 Update! It’s been another hectic year for me since I started my game development journey, lots of ups and downs but ultimately a worthwhile journey with still a lot more to come. That’s enough about me though, I’m sure you are more interested in knowing about the state of Dead Monarchy. As of today, I’ve more or less been developing Dead Monarchy “consistently” for 2 solid years. I can’t truly say it’s full time as I still have to work at my day job, but I’ve poured every ounce of my remaining energy into development. At this point, the initial core gameplay loop has been completed for “Survival Mode” and I am now busy playtesting it and balancing as best as I can. I’m a solo developer so there is only so much balancing and playtesting I can do myself and I can only balance to my personal tastes that I’ve acquired through my own experiences. So with that said, I’m planning to release Dead Monarchy into early access towards the end of the 1st quarter this year. I’ll be heavily relying on the feedback I get during early access and you’ll also be able to directly shape the future of this game. After I release into early access, I’ll also then release another demo build, as the current one is now heavily outdated. “Strength” is both your health but also partially determines how much melee damage you do. The lower your health, the less damage you do. Armor directly mitigates damage as opposed to a percentage, however helmets and armor have a durability rating and will require repairs. There is a “morale” system. Resolve influences the chance of critical hits and when it drops to 0, the combatant will rout. A combatant will stop routing after a certain period. Different levels of elevation. Standing on higher levels provides combat bonuses. Zone of control or attacks of opportunity. Disengaging from melee range, prompts a free attack on the combatant trying to flee. Flanking and position bonuses. Attack a combatant directly from the back provides a bonus hit chance and bonus damage that bypasses the target’s helmet/armor value. Attacking from the left or right also provides a small bonus to hit chance. 9 weapon types have been implemented. Each weapon type has 5 unique abilities that are made available to anyone that is equipping the weapon. Hatchet, mace, sword, rapier, greataxe, warhammer, claymore, crossbow and longbow. Two handed weapons can attack diagonally, longbows and crossbows can shoot over long distances. 50 armor models divided into 10 tiers of armor progression. Each tier has multiple unique armor models to increase character customization. 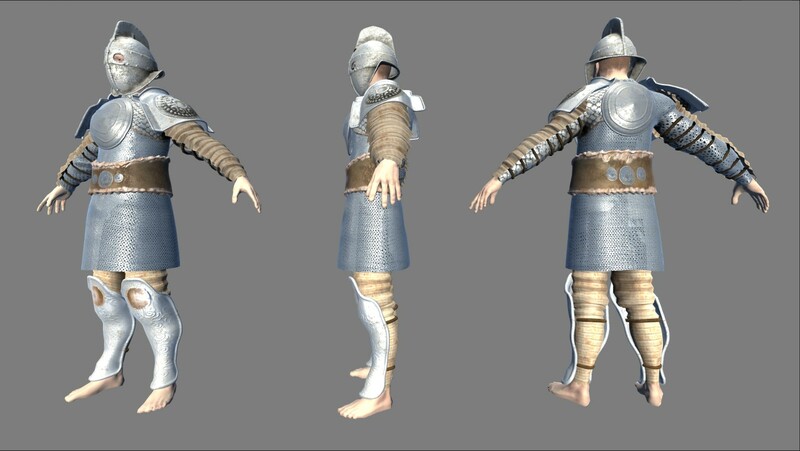 Helmets, armor, shields and weapons will be visually displayed on the character model. 65 monsters have been implemented into the current build to serve as the enemy. 60/65 monsters have unique models and each monster has its own unique ability. Monsters are divided into 6 factions, with the remaining 5 monsters serving as “boss monsters”. Each monster’s ability will help define the overall playstyle of each faction, with monsters not only creating synergy with other monster types within their own faction, but also the environment, to continually provide a challenge to the player. 5 unique biomes to fight in. Forest, plains, desert, swamp and tundra. Each biome type has unique factors that influence combat and also help to make each environment unique. Each biome type is home to a unique faction, with the 6th faction only showing up during a base siege. Maps are also partially randomly generated. So elements like elevation, trees, rocks or biome specific grid tiles can spawn in different clusters/shapes or sometimes as individual elements. So far, only one mission type has been implemented. “Raiding” or an extermination mission type is as the name implies, to kill everything in sight. More mission types will surely be added in the future though. Experience system. Combatants gain experience through combat and will level up when a threshold is met. The player cannot assign stat points directly, combatant stats will grow automatically based on the background of the combatant. IE the stats of a “raider” will be different to the stats of a “hunter”. It may be more logical to make your “hunter” a ranged weapon user but there is nothing stopping that “hunter” from using a greataxe. There are also exceptions to this rule, you may find that one “hunter” that breaks traditional convention and happens to also have extremely high Strength which could then make him suitable as a melee focused combatant. In short, backgrounds are not just for flavor text but at the same time are not as restrictive as a “class”. Reaching a level will also provide a “Perk Point” but the perk system has not been implemented yet and most likely won’t make it into the initial early access build. 2. Base - The basic foundation for the player base has now been completed, with only a few of the smaller buildings left to implement. The basic siege mechanics have now been implemented.There is a siege timer that the player must work against and constantly keep in mind. If the siege results in a player defeat, but the player still has surviving combatants after the siege, the base buildings will be damaged and the upgrade levels will be reduced by 1. Siege battles are hard and can be game over if the player’s company is completely wiped out. 7/9 buildings have been implemented in terms of their functionality and UI. Visual upgrades have not been implemented yet and the current base models are still heavily WIP. There are buildings that influence or unlock combat party size, inventory space, combatant healing, combatant recruitment, item trading, mission costs and item crafting. Each building requires its own unique resource with each resource only available in certain biomes. The building that you decide to upgrade will largely determine which biome you’ll be fighting in. There is also a crafting system that functions similar to the building upgrades system. Each weapon and armor tier requires a specific resource. The difficulty of a mission will determine which resource is rewarded. The first pass on the base UI has been done as well. Here you can keep track of how much gold and food is required to maintain your mercenaries and also their morale. If morale drops to 0%, mercenaries will start to leave as each day passes. The UI keeps track of how many days have passed, which determines how long building upgrades take to complete, the next siege and enemy faction strength. You can only go on one mission per day, once you come back whether through victory or defeat, you must press “End Day” to progress the game to the next day. 3. Loop - As mentioned, the basic gameplay loop for “Survival Mode” has been completed. Survival mode is basically a condensed version of the overall game that will be first released into early access so players can give feedback on the core gameplay, especially the combat. The main objective of “Survival Mode” is to defeat the 5 “Monarchs”. Terrible creatures that have mutated to incredible heights of power and each maintain control over a specific biome. During each mission, the monarch has a low chance to spawn. It’ll be up to you whether you want to attempt to kill it or retreat from combat. Monarchs can show up during early game, which generally results in a party wipe. The monarchs will try to stop you by laying siege to your base every 30 days. Enemy difficulty and size scales over time and each siege will only get harder. There is a hard cap though for scaling. The same applies to the separate factions you encounter in each biome. They will grow stronger over time, but the size is determined by the mission difficulty. In order to stop the ever growing power of the monarchs and the monstrous factions they control, you must upgrade your base to provide the much needed bonuses and upgrades for your own mercenaries. As such the loop goes like this: Pick a building to upgrade, which determines which biome you’ll fight in. Pick a mission difficulty, the harder it is, the more the rewards but also enemies you’ll face. Complete the mission through turn-based tactical combat, taking advantage of the many combat mechanics that have now been implemented. Receive rewards based on the difficulty of the mission you completed. Rewards can be resources required to upgrade buildings or weapons and armor that can be equipped, provide stat bonuses and are visually displayed on the character model. Experience is also rewarded but the “Perk System” has not yet been implemented. By this point, you would have heard “Survival Mode” tossed around a lot. It’s basically how I’ve structured the development of this game. I have always intended for overworld exploration through a world map with various locales to explore, but that is a huge task that requires time but also money. Releasing into early access will not only provide me with essential feedback on one of the core pillars that being combat, but also provides me with some additional funds. More money means I can concentrate more on development of Dead Monarchy as opposed to finding work just to sustain my day to day needs. Over time I will slowly morph “Survival Mode” into the full game experience with the inclusion of the world map. The various biomes that I’ve already created will serve as combat maps for encounters that take place in the wilderness. Interior maps for dungeons and buildings will also be created as well as combat that takes place in other man-made environments, say the exterior of a crumbling ruin or graveyard. Many of other systems like crafting and the base building system will be kept intact but something like the player base will be unlocked through time or a certain amount of money as opposed to straight away. Initially, I wanted to keep “Survival Mode” and “Monarchy Mode” separated, with the later being unlocked when the world map was added but I don’t think that is possible anymore. For people who want a more condensed experience, I will also eventually add a “dungeon delving” system that works similar to the current “Survival Mode” but the environments are replaced with dungeons. This is because currently, I am just abstracting the amount of time it takes to travel to these far flung places which will eventually be represented on the world map. The current system would make little sense when the world map is added but it will translate better to a dungeon complex with many levels, something akin to a tower. To wrap everything up, I plan to price Dead Monarchy at $15 USD and by the time it leaves early access, I hope to have created enough content to justify a $25 USD price tag. That said, I will continue to support the game even after full release with free updates. You can screenshot this now and burn me at the stake if I go back on my word. Sometime later this month, I hope to release a few gameplay videos when I have polished it up a bit more. At the end of this month, I will submit the game to Steam for them to review it, all the paperwork for Steam Direct has already been completed. So yeah, I will initially release onto Steam only, once it comes out of early access, I’ll look into other storefronts. I'll be talking about random map generation and the player base.